I am excited about the future of The Wenatchee World as we make the transition Sunday from 111 years of leadership by my family to Francis Wick and his family. The sale of this newspaper to Wick Communications, which takes effect Sunday, secures the future of The Wenatchee World as a family-owned community enterprise for years to come. The Woods and Wick families share similar histories and values. Both families are dedicated to helping their communities succeed. Jeff Ackerman, my successor as publisher, is a seasoned veteran and well-respected. He’ll bring wonderful leadership to our organization as well as a commitment to community service. As my family pondered the future last year, we realized that the economics of this industry are such that it will be exceedingly difficult for a solo independent newspaper to thrive. It makes far more sense to be part of a network of newspapers sharing expertise, resources and buying power. So last fall we decided to start looking for a like-minded family corporation that could carry on the great work started by my grandfather Rufus, my father Wilfred and his cousin Robert. They established a philosophy that The World was a public trust and our family was serving as stewards. Running this newspaper was never about maximizing the bottom line but instead about trying to be the glue of the community. We have done our best to live those values, but have certainly fallen short on more than a few occasions. The first time I met Francis, I knew instinctively that Wick Communications would be an ideal owner. He’s recognized as one of the greatest talents in our industry and, I’m told, revered by those who work for him in much the same way our employees revered my father. He’s bright, energetic, personable and has a terrific sense of humor. In this business, humor is a requirement. Selling the newspaper was not an easy decision for our family, but it was the right decision for the employees of The World, the company and our communities. One thing I can tell you is that I’m not going anywhere. I’m excited to continue my work as a columnist and podcaster (artofcommunityncw.com) for this newspaper. I plan to dedicate my time and energy for years to come to help his company and its employees succeed. Our family retains ownership of the historic building at 14 N. Mission St. and The World will continue to base its newspaper operations there and we are thrilled to maintain that connection. Newspapers belong in a downtown setting. It has been an honor to serve as publisher for the last two decades. I feel blessed to have had amazing employees dedicated to doing great work. They have given their heart and soul to company and deserve all of the credit for our success. I’m also thankful to our loyal readers and advertisers who have allowed us to serve the community for so many years. We had a party at our production building recently to honor the winners of the World’s Best contest for local businesses and it was wonderful to rub elbows with so many great local citizens. We live in an amazing place with great people. Looking at our history in the valley, this newspaper has made important contributions to civic life in the Wenatchee Valley and North Central Washington. A hundred years ago, my grandfather wrote the first story about the crazy idea of building a dam at Grand Coulee. He dedicated his life to the Columbia Basin Project. My father championed development of the region and, with my mother Kathleen, made support for the arts their lives’ work. My uncle Robert made indelible contributions to the North Central Regional Library. Their work should inspire all of us to do what we can to serve our communities and not just our own self-interest. 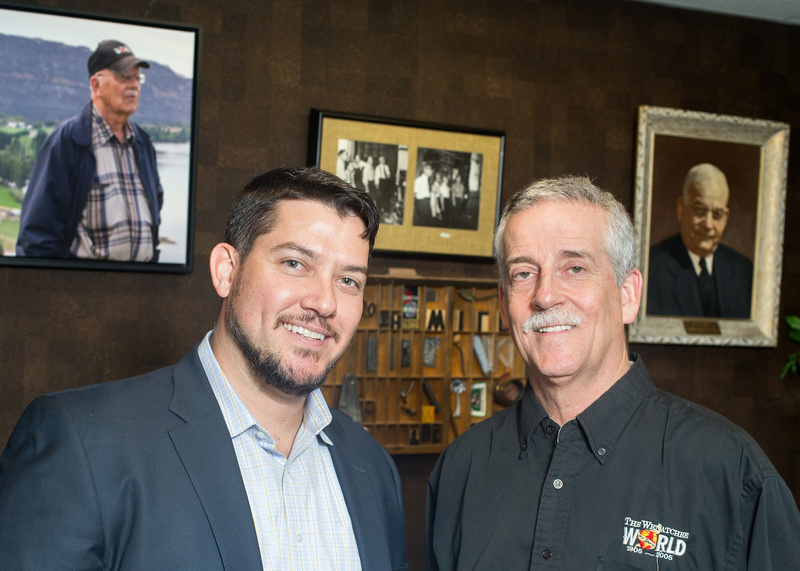 The Woods families stands shoulder-to-shoulder with Francis, the Wick family and the employees of The World in ushering in the next great era of The Wenatchee World. We’re turning the page to an exciting new chapter. Wick Chief Executive Officer Francis Wick, at left, and Rufus Woods, former publisher of the Wenatchee World. Wick Communications purchased the Wenatchee World from the Woods family. The Woods and Wick families pose for a photo in front of The Wenatchee World. 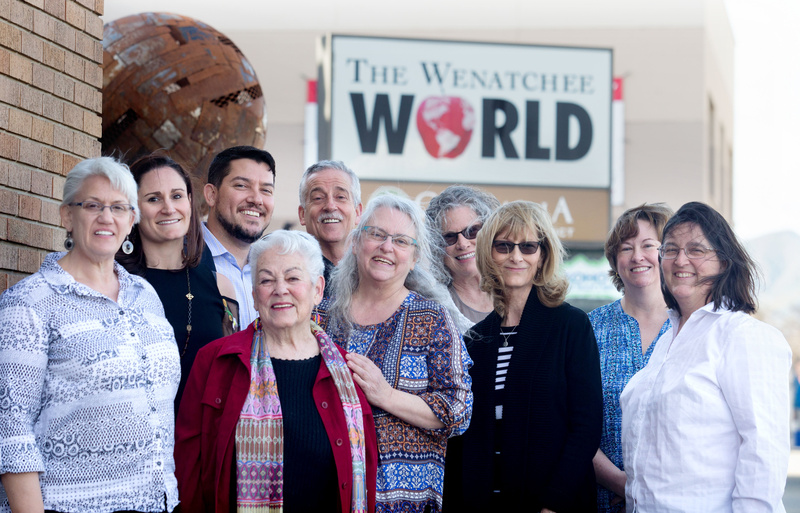 Wick Communications purchased The Wenatchee World from the Woods family. From left, Rebecca (Wick) Rogers, Mandy Wick, Francis Wick, Kathleen Woods, Rufus Woods, Kara (Woods) Hunnicutt, Carolyn (Woods) Ollikainen, Barbara Woods, Wendy (Woods) Manhart and Gretchen Woods.